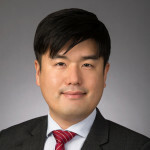 Jay (Juyoung) Kim focuses his practice on the preparation and prosecution of patent applications in telecommunications, semiconductors, network technology, computer software and security, and financial services. Jay has diverse legal and industry work experiences. He worked as a research engineer in Samsung Electronics, designing electronic circuits for complementary metal-oxide-semiconductor (CMOS) digital image sensors, for applications in smartphone digital cameras. He also worked as a patent engineer at a major law firm in South Korea, reviewing U.S. patent applications for semiconductor device manufacturing patents. During law school, he worked as a summer associate at a major U.S. intellectual property law firm in Washington D.C., conducting legal research in patent law and drafting legal memoranda related to intellectual property litigation. Jay is currently in his third year at Antonin Scalia Law School at George Mason University, and is expected to graduate in May 2018. Jay was a past summer associate at the Washington D.C. office of Banner & Witcoff. During law school, he was awarded the 1L Leadership Council on Legal Diversity (LCLD) Fellowship and participated in the Scholars Summit in Chicago. Prior to law school, Jay received a Bachelor of Science degree in mechanical engineering from Stanford University in 2007, with a minor in electrical engineering. He also received a Master of Science degree in electrical engineering from Stanford University in 2008. Jay is a native of South Korea and fluent in Korean and English.